On the 14th (Tue), enjoy the sand and surf at Fort Funston National Park and then stroll through Baker Beach. On the 15th (Wed), you'll have a packed day of sightseeing: contemplate the long history of SS Jeremiah O'Brien, then steep yourself in history at Alcatraz Island, and then snap pictures at Golden Gate Bridge. To find ratings, other places to visit, reviews, and tourist information, read our San Francisco attractions planner . London, UK to San Francisco is an approximately 14-hour flight. You can also do a combination of flight and subway; or do a combination of flight and shuttle. Due to the time zone difference, you'll gain 8 hours traveling from London to San Francisco. Traveling from London in May, things will get a bit warmer in San Francisco: highs are around 24°C and lows about 13°C. Wrap up your sightseeing on the 15th (Wed) to allow time to drive to Monterey. Monterey is a city in the U.S. For reviews, ratings, more things to do, and more tourist information, use the Monterey trip maker site . You can drive from San Francisco to Monterey in 2.5 hours. Other options are to fly; or take a bus. In May, daily temperatures in Monterey can reach 21°C, while at night they dip to 12°C. On the 16th (Thu), you're off toBig Sur. Carmel-by-the-Sea, often simply called Carmel, is a city in Monterey County, California, United States, founded in 1902 and incorporated on October 31, 1916. Kick off your visit on the 16th (Thu): contemplate in the serene atmosphere at Carmel Mission, then contemplate the long history of San Carlos Borromeo de Carmelo Mission, and then learn about winemaking at Dawn's Dream Winery. Use Inspirock's suggestions to plan your Carmel trip and find the best activities and attractions for your vacation. Carmel is very close to Monterey. May in Carmel sees daily highs of 21°C and lows of 12°C at night. Wrap up your sightseeing by early afternoon on the 16th (Thu) to allow time for the bus ride to Big Sur. To find reviews, more things to do, maps, and tourist information, read our Big Sur trip planner . Big Sur is just a stone's throw from Carmel. In May, plan for daily highs up to 21°C, and evening lows to 12°C. Wrap up your sightseeing on the 16th (Thu) to allow time to drive to Pismo Beach. Pismo Beach is a city in San Luis Obispo County, in the Central Coast area of California, United States. Kick off your visit on the 17th (Fri): tour the pleasant surroundings at Pismo State Beach and then take in the history at Mission San Luis Obispo de Tolosa. To see photos, maps, and tourist information, refer to the Pismo Beach trip itinerary maker tool . Getting from Big Sur to Pismo Beach by car takes about 4 hours. Other options: do a combination of taxi and train. When traveling from Big Sur in May, plan for a bit warmer days in Pismo Beach, with highs around 26°C, while nights are about the same with lows around 12°C. Cap off your sightseeing on the 17th (Fri) early enough to go by car to Santa Monica. Your cultural itinerary includes sights like Santa Monica Pier and Ocean Avenue. Take a break from the city and head to Santa Monica State Beach and Santa Monica Mountains. Venture out of the city with trips to Ronald Reagan Presidential Library and Museum (in Simi Valley) and Manhattan Beach (in Manhattan Beach). The adventure continues: get a taste of the local shopping with Third Street Promenade and look for gifts at Magicopolis. 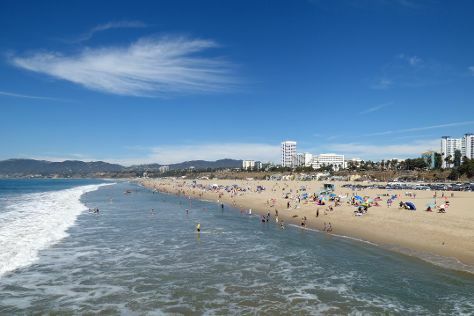 To see ratings, reviews, and other tourist information, refer to the Santa Monica trip planner. Drive from Pismo Beach to Santa Monica in 3.5 hours. Alternatively, you can do a combination of bus and flight; or do a combination of train and bus. Traveling from Pismo Beach in May, expect somewhat warmer with lows of 17°C in Santa Monica. Finish your sightseeing early on the 20th (Mon) so you can drive to Palm Springs. Palm Springs is a desert resort city in Riverside County, California, United States, within the Coachella Valley. Kick off your visit on the 21st (Tue): explore the fascinating landscape at Coachella Valley Preserve, then look for gifts at Brandini Toffee, and then admire all the interesting features of Indian Canyons. To find reviews, maps, more things to do, and other tourist information, read Palm Springs trip planning website . You can drive from Santa Monica to Palm Springs in 2.5 hours. Other options are to do a combination of bus and flight; or do a combination of bus and train. While traveling from Santa Monica, expect much hotter days and somewhat warmer nights in Palm Springs, ranging from highs of 39°C to lows of 22°C. Finish up your sightseeing early on the 21st (Tue) so you can go by car to Grand Canyon National Park. Kick off your visit on the 22nd (Wed): get great views at Mather Point, then hike along South Kaibab Trail, and then explore the stunning scenery at Grand Canyon South Rim. For where to stay, more things to do, ratings, and tourist information, use the Grand Canyon National Park trip itinerary builder site . Getting from Palm Springs to Grand Canyon National Park by car takes about 6.5 hours. Traveling from Palm Springs to Grand Canyon National Park, you'll lose 1 hour due to the time zone difference. Prepare for cooler weather when traveling from Palm Springs in May: high temperatures in Grand Canyon National Park hover around 23°C and lows are around 0°C. Finish your sightseeing early on the 22nd (Wed) so you can travel to Las Vegas. On the 23rd (Thu), examine the collection at The Mob Museum, then shop like a local with The Strip, and then admire the local landmark of Bellagio Fountains. 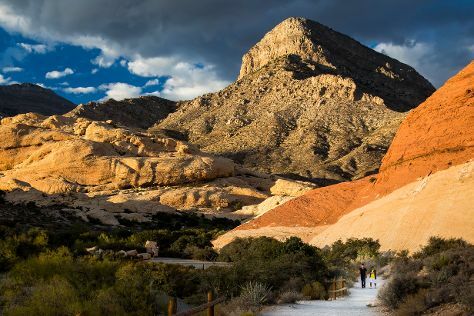 On the 24th (Fri), you'll have a packed day of sightseeing: see the interesting displays at The Neon Museum and then explore the stunning scenery at Red Rock Canyon National Conservation Area. Ask Inspirock to suggest an itinerary and make planning a trip to Las Vegas fast, fun, and easy. You can do a combination of flight and car from Grand Canyon National Park to Las Vegas in 4.5 hours. Alternatively, you can drive; or take a shuttle. The time zone changes from Mountain Standard Time to Pacific Standard Time, which is usually a -1 hour difference. When traveling from Grand Canyon National Park in May, plan for a bit warmer days and much hotter nights in Las Vegas: temperatures range from 36°C by day to 20°C at night. Wrap up your sightseeing on the 24th (Fri) to allow time to drive to Death Valley National Park. Start off your visit on the 25th (Sat): get engrossed in the history at The Ranch at Furnace Creek and then take in the dramatic natural features at Zabriskie Point. To find ratings, where to stay, and other tourist information, refer to the Death Valley National Park trip itinerary planner . You can drive from Las Vegas to Death Valley National Park in 2.5 hours. Other options are to do a combination of bus and taxi; or take a bus. Traveling from Las Vegas in May, you can expect nighttime temperatures to be slightly colder in Death Valley National Park, with lows of 15°C. Finish your sightseeing early on the 25th (Sat) so you can drive to Yosemite National Park. 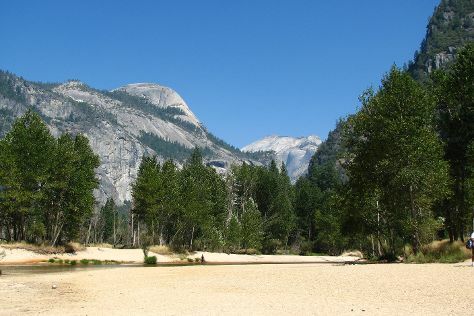 On the 26th (Sun), get to know the fascinating history of Big Trees Lodge, National Historic Landmark, then take some stellar pictures from Tunnel View, then take your sightseeing to a higher altitude at Cathedral Beach Picnic Area, and finally take in the dramatic natural features at Glacier Point. On your second day here, explore the striking landscape at North Dome and then take in the dramatic scenery at Yosemite Falls. For more things to do, photos, traveler tips, and other tourist information, you can read our Yosemite National Park trip builder website . Drive from Death Valley National Park to Yosemite National Park in 8 hours. Alternatively, you can do a combination of car and bus. When traveling from Death Valley National Park in May, plan for little chillier days in Yosemite National Park, with highs around 21°C, while nights are colder with lows around 1°C. Cap off your sightseeing on the 27th (Mon) early enough to go by car to San Francisco. 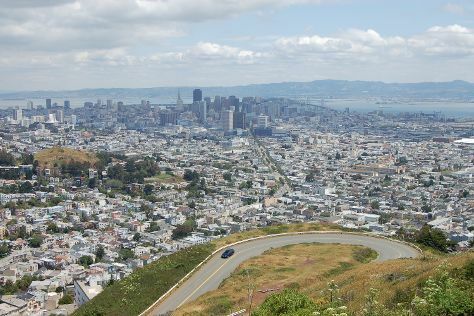 Start off your visit on the 28th (Tue): identify plant and animal life at Strawberry Hill and then take your sightseeing to a higher altitude at Twin Peaks. To find photos, ratings, other places to visit, and other tourist information, you can read our San Francisco trip itinerary planner . Drive from Yosemite National Park to San Francisco in 4 hours. Alternatively, you can take a bus; or do a combination of taxi, bus, flight, and subway. Traveling from Yosemite National Park in May, you can expect nighttime temperatures to be somewhat warmer in San Francisco, with lows of 13°C. Wrap up your sightseeing by early afternoon on the 28th (Tue) to allow time for travel back home.